“Longmire” disappoints! Episode 43 TOTALLY unbelievable! 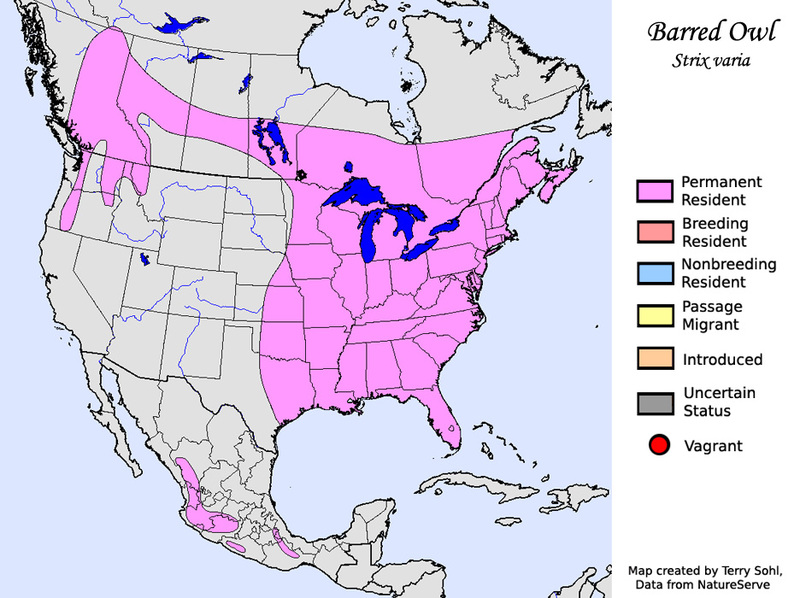 Do you see Barred Owls in any part of Wyoming on this range map? I’m not a huge Netflix junkie, but there are a few TV series that I have watched in their entirety. Recently I’ve been watching “Longmire”, a series focused on (fictional) Absaroka County in Wyoming. It follows the Absaroka County Sheriff’s Department, with the sheriff himself being “:Walt Longmire”. There are four seasons of the show on Netflix, and 43 episodes. Last night I watched the last one, episode 43. After devoting the time to watch the entire series, after following all the individual storylines, after waiting in anticipation how some of those may play out in this episode, my impression of the entire series changed on a dime with the very first sound of episode 43. When episode 43 starts, the scene is set at a medicine woman’s house out in the middle of nowhere, in the ‘mountains” on a Crow Indian reservation. The first sound you hear as the scene fades in from black…an owl calling. I’ve been birding 15 years now. I can identify anything by sight. I’m not the world’s greatest birder in identifying things by sound, but it certainly sounded like the distinctive hooting of a Barred Owl that opened up episode 43. The problem? There are no Barred Owls in Wyoming!! It’s never quite clear where the fictional Absaroka County is supposed to lie in Wyoming, but it doesn’t matter as there’s no region in Wyoming where the species is found. 43 episodes. 43 hours devoted to a show. RUINED by careless sound editing. Somehow, someway, I managed to struggle through the remaining 59 minutes of the show. During that time there’s another instance where you hear the hooting of a Barred Owl. OK, no, it really didn’t “ruin” the show for me, but it is irritating when you’re watching a movie or a TV show and there’s an “inappropriate” bird sound. It happens a lot. Note that if you see ANY kind of hawk or eagle in a movie, the accompanying sound is very likely to be the distinctive cry of a Red-tailed Hawk. Sure, it’s a cool sound, a sound that helps to set the stage for a “wild” scene. But c’mon! When I see a circling Bald Eagle on the screen, I don’t want to hear the accompanying cry of a Red-tailed Hawk!! Be careful, Hollywood! We birders are watching! Inappropriate bird sounds in entertainment could be Hollywood’s undoing! A revolution is brewing, a revolution led to disgruntled birders who want REALISM in their Hollywood entertainment!! Previous Post: Pictures! Of things with “feathers”! !